Here's what you won't see frolicking on the sand at Children's Pool. Children. Its name is deceiving. In 1931, Ellen Browning Scripps funded the building of a seawall to protect this tiny beach from channel waves and deep waters to create a safe beach area for young children. It performed well for over 40 years as families with young kids flocked to this haven of white sand and shallow waters. In the 1970s, harbor seals discovered that it was also the perfect hang- out for sunbathing, playful antics and having baby seals. For many years the coexistence of kids and seals made Children's Pool even more exciting for the youngsters. As long as people did not bother the seals, they rested in the warmth of the sun as the children played in the sand and tested the gentle waves that made their way onto the beach. In the late 1990s city officials deemed that Children's Pool Beach was unsafe for humans since the bacteria levels from the harbor seals' excrement posed unhealthy dangers. Ever since, use of the beach had been controversial leading to litigation and protest pitting pro-children against pro-seal advocates. As the controversy continues, children and their families still flock to Children's Pool but as spectators and not swimmers. 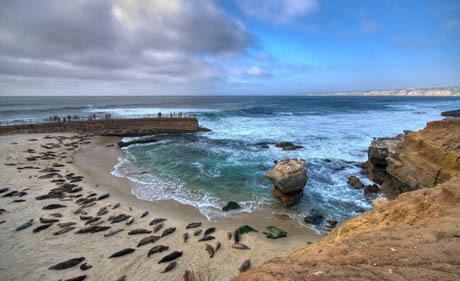 In spite of some often heated debate, the beach has become one of La Jolla's most popular attractions as tourists and residents come to the beach to see the harbor seals up close and personal. Spectators will often reach over 100,000 per month during the summer vacation period. The concrete sea wall with its guard rails permit visitors to walk between the beach and the rough incoming ocean waves to more closely observe the basking seals from different angles. The seals seem to enjoy the attention and often put on some extra showtime with playful antics. Although the controversy has lightened up over the years, the rules of people engagement with the seals often change. If you visit Children's Pool, always check with the lifeguard before joining the seals on the beach. Regardless, no one is permitted to bother the seals and visitors must realize that the seals are wild and can be unpredictable. They can, and have bitten people before. Observing the seals from the top of Children's Beach or walking on the seawall is the safest way to see the seals. It is an amazing experience, particularly for the children. You might consider bringing some rain gear since the incoming waves hitting the seawall can create some pretty big splashes. One thing for sure. Visitors are rewarded with some great views down the coastline to other beaches and over the Pacific Ocean horizons. Being located near the Village of La Jolla and grassy parks makes it very convenient to visit restaurants in the Village or having a picnic in the park. Lifeguards are staffed daily throughout the year. During summer, lifeguard staffing hours are generally 9:00 a.m. to dusk. At other times of the year, lifeguard staffing may not commence until 10:00 a.m. A public restroom with showers is located beneath the lifeguard station.This is a popular beach area for scuba divers because of the reefs just offshore. These same reefs can create very strong currents and other hazards, particularly in high surf conditions. Most California beaches experience strong rip currents. Know the methods of freeing yourself if caught in a rip current. The best advice is to swim near a lifeguard. From the north. Take Interstate 5 to La Jolla Village Drive, westbound. Turn left on Torrey Pines Road at the signalized intersection. Follow Torrey Pines Road to the signalized intersection at Prospect Street and turn right. Watch for the signs and bear right on Coast Boulevard. From the south. Take Interstate 5 north to La Jolla Parkway. Continue on as it becomes Torrey Pines Road. Follow Torrey Pines Road to the intersection at Prospect Street and turn right. Watch for the signs and bear right on Coast Boulevard. There is very limited on-street parking at La Jolla Cove. On-street parking can be difficult to find, particularly during the summer. It is limited to three hours at a time on weekdays and unlimited on weekends. Paid parking is available in La Jolla Village at several locations and is a relatively short walk from the beach.